"In a world that has completely lost it's mind, it is so nice to know that there is at least one constant - an amazing brand spanking new, medium scale 1962 Fender Jazz Bass replica - available for purchase right now from Fender Japan. 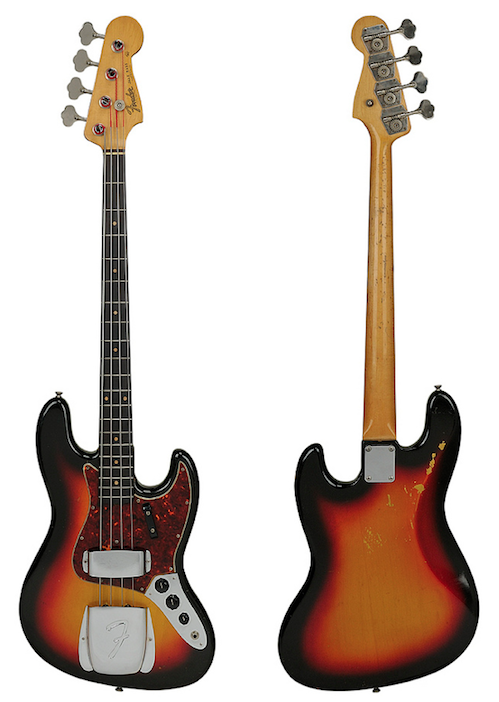 Really, who wouldn't want this beautiful Fender Jazz Bass, the absolute pride of Leo Fender? And especially a 1962 replica in medium scale. A 1972 American Jazz bass broke my heart with numerous dead spots in the neck, but this one has restored my faith. I have wanted one for years - one without dead spots in the neck that fits me properly - and what do you know - I finally have one and I love it!" 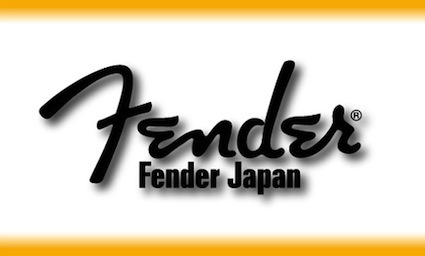 Fender Japan apparently never got the memo that medium scale basses are not on the menu. This medium scale Jazz bass offering out of Japan is an exact replica of the 1962 model, with the exception of the fact that they do not arrive with bridge or pickup covers. It is absolutely my preference not to have the covers - as we all know, the removal of those covers is usually the first ceremony we perform on these instruments. Then we have ugly body holes. On this beauty - there are no body holes, so no corresponding ugliness. If you want the covers, buy 'em, drill the holes and put 'em on. Your choice. The only thing I have done with this bass is I left the head stock gloss but I had the back of the neck taken down to satin. I don't like gloss finishes on any of my necks. The frets also needed some dressing as they were on the sharp side. Here are Fender's technical notes on the 1962 Jazz Bass with photos of the front and back of both below - featuring both a long scale instrument and mine - just for comparison sake. "The Fender Jazz Bass was designed in 1960 by Leo Fender as his top of the line bass guitar. It had a radically tapered neck, narrow nut, offset body and two pickups. The pickups were designed with two pole pieces per string which produced a mellower tone and a less percussionized signal that was more forgiving on the not-so-reliable bass speakers of the '50s and '60s. The earliest Jazz Basses from 1960 through very early 1962 had concentric “stack knob” controls. Fender then switched to the typical 3-knob control system which was, ironically, used on the Jazz Bass prototype in 1959. The slab rosewood board was found on Fenders, including the Jazz Bass, from 1959 through about July or August 1962. The early Jazz Basses (1960 – 62) also were equipped with felt tipped spring mutes since Leo felt that they imparted a more accurate acoustic string bass sound which jazz artists would prefer." This medium scale Fender Jazz Bass replica from June of 1962 has a solid body comprised of a single piece of alder. The body finish is tri-color sunburst in amber, cherry and black with a nitrocellulose gloss lacquer topcoat. This bass weighs in at 8.8 lbs and the width of the neck at the nut is 39mm. 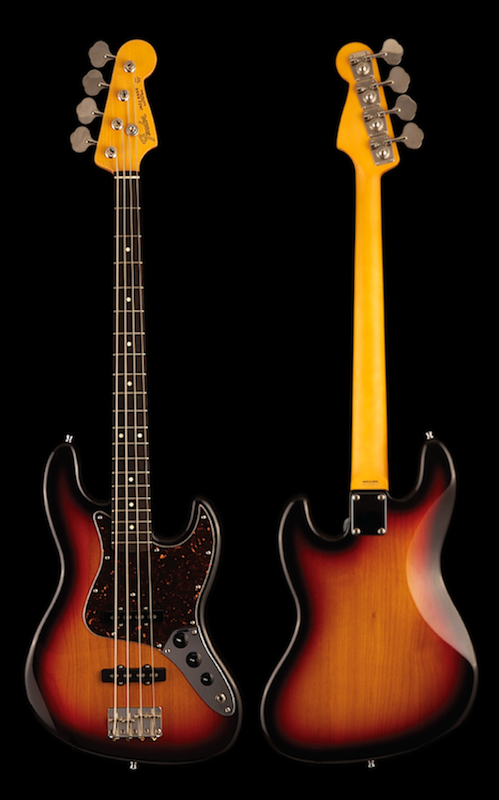 The neck is one piece maple which Fender has tinted vintage amber in the spirit of the 1962 replica concept. The neck is secured with the Fender standard four bolt system - while the fingerboard is slab Brazilian rosewood with clay dot markers. The simulated tortoise shell pick guard is made of nitrate laminate. The bridge is Fender steel with individual bridge saddles and chromed. The nut is plastic and the tuners are Fender nickel, chromed. The pickups are two single coils by Fender each with dual pole pieces. The controls are master tone and a volume control for each pickup. The scale length is 32" medium scale. What more can you possibly say about this instrument, except - thank you - now I can finally play one too.